Only part of our content is available in the language you selected. See what content is available in Español. 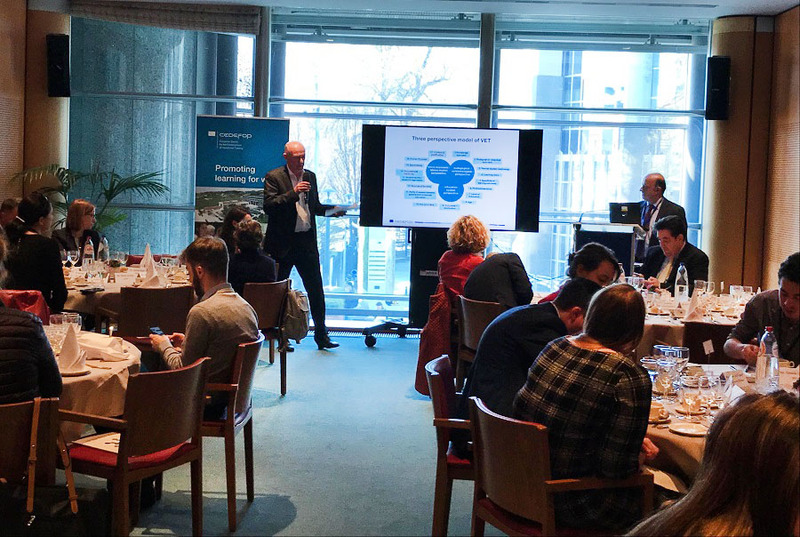 Findings of Cedefop’s research on vocational education and training’s (VET’s) future role were discussed at a European Parliament event hosted by Anne Sander MEP in Brussels on 27 February. Over 40 participants, including MEPs Michaela Šojdrová and Anthea McIntyre and the Director-General of European Commission’s DG Employment, Social Affairs and Inclusion Joost Korte, exchanged views on the subject. According to Ms Babrauskiene, Cedefop’s research on the future of VET will certainly trigger a debate on how it can provide Europe with future-oriented skills that are relevant to a rapidly changing environment. Cedefop’s Head of Department for VET Systems and Institutions Loukas Zahilas and expert Jens Bjornavold presented the research findings. Starting from the project rationale and the necessity to analyse developments during the past 20 years, they focused on the changes in European vocational education and reflected on future scenarios for 2035. Mr Bjornavold said that there are two competing VET narratives in Europe today: a negative where VET is becoming increasingly marginalised and a positive where VET is expanding to both lower and higher levels. Paradoxically, both are true depending on how we conceive VET. If we are looking at VET as a narrow concept focusing on specific occupation and middle-skilled jobs, then it is really under threat. If we have a broader understanding of VET as vocationally oriented learning, including lower and higher levels, we see it thriving. The three scenarios presented include the ‘pluralistic’ in which VET becomes the standard educational pathway for all, part of lifelong learning and, consequently, higher VET becomes part of the higher education system. In this scenario VET is understood as vocationally oriented learning in various contexts. The ‘distinctive’ scenario sees VET again as the standard educational pathway but remaining a distinct educational sector – a modernised version of VET. In the third scenario, the ‘special-purpose’ VET is understood as skills training for labour market inclusion. Mr Zahilas commented on the strengths and limitations of the scenarios, saying that we are not trying to predict the future but rather seek to illustrate the implications of different choices. Scenarios alert policy-makers to different trends and their consequences and they will never materialise in the pure form. Elements of each one will be found in different countries and different settings. Importantly, scenarios are linked to their history; they are therefore path-dependent and will somehow still reflect their past. Well-informed decisions need to be based on evidence from research – a very important principle of EU policy-making – and today’s event is a very good example of how we do this, he concluded.